The countdown is on for the world’s biggest fashion extravaganza! Fashion’s Night out is only 11 days away and this is a party no one will want to miss! Fashion’s Night Out was created in 2009 during the height of the recession by Anna Wintour, Vogue editor-in-chief, Diane Von Furstenburg, president of the Council of Fashion Designers of America (CFDA), NY & Co and the City of New York. The goal was to celebrate fashion, restore consumer confidence, and boost the industry’s economy during the recession. In terms of participation, Fashion’s Night Out has been successful! In 2009, eleven countries and 700 stores took part in the evening’s festivities. According to estimates by ShopperTrak, participating retailers saw a 3.4% increase in store traffic nationwide and a 48% increase in New York City alone. Fashion’s Night Out 2010, was held in 16 countries. It was run by fifteen editions of Vogue magazine. The event occurred over eight days including New York Fashion Week. In 2011, Fashion’s Night Out was even bigger. Eighteen countries (including, Brazil, China, France, Greece, Japan and South Korea), more than 250 United States Cities, and over a thousand retailers in New York City participated in this global event. On September 6, 2012, shopping centers, department stores, boutiques, and fashionable avenues all over the world are gearing up for the fourth annual observance of Fashion’s Night Out!. Designers, stylists, celebrities, models, fashion editors, fashionistas, and diva dogs, in cities across the country and around the world will come out for this extravaganza! Diane Von Furstenberg: Solange Knowles is scheduled to deejay the party at DVF’s Washington Street store. Calvin Klein: Dwyane Wade will be at the 654 Madison Avenue store. Henri Bendel: Cirque Du Soleil will literally be in the building. Macys: Michael Kors will host a game of fashion trivia at the Heralds Square location. Beverly Center: Festivities will be hosted by “Pretty Little Liars “star Lucy Hale following Mayor Villaraigosa’s welcome video. Rodeo Drive: 30 – 40 stores are expected to host individual events. 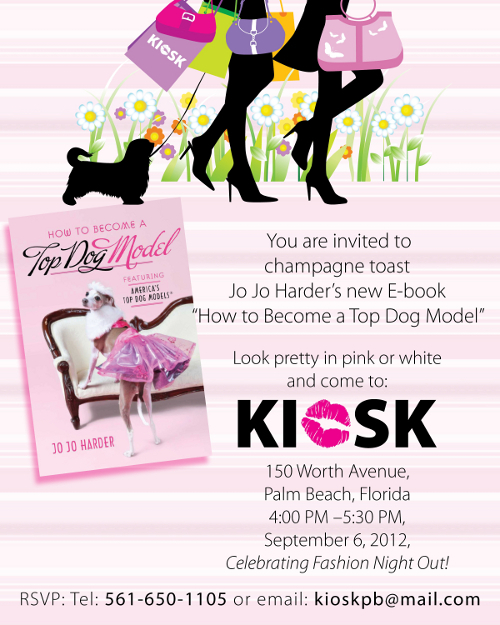 Kiosk: E-Book Launch party for How to Become a Top Dog Model, 150 Worth Avenue. Guests are requested to “look pretty” in pink or white. Pucci & Catana: Red Carpet Style Fashion Show featuring America’s Top Dog Models®, in front of Chanel and Tiffany: http://www.americastopdogmodel.com/events.htm. Alex & Ani: Shopping Bag Dress Competition. The Art Institute of Ft. Lauderdale’s Fashion Design Students are competing for a $2,000 scholarship for the winning entry, which will be announced on the night of FNO by Mayor Coniglio. Lamborghini Palm Beach: Local Title Sponsor for Worth Avenue Celebrates: Fashion’s Night Out! These fabulous cars will adorn Worth Avenue. To kick off this exciting, global event, Fashion’s Night Out has released an awesome, PSA video. R & B artist, Usher opens the video that includes Marc Jacobs, Justin Bieber, Liya Kebade, Taylor Swift, Tyson Chander, and other big names, all grooving to Glee actor Darren Criss who lends his voice to a cover of Madonna’s Dress You Up and telling the world how fabulous September 6, is going to be! Previous articleVanessa and Angela Simmons give us Pastry!